ATTRACTIONS & EVENTS More than 200 years of history wait to be discovered at Fort George and Buckingham House Provincial Historic Site, located eleven kilometers east of Elk Point via Highway 646. (Read more about it on the opposite page). Located on Highway 41 north of town stands a 32-foot statue of explorer Peter Fidler. More recent town history is depicted on a 100-foot mural. Elk Point OUTDOORS The community is located along Alberta's Iron Horse Trail, an all-season recreational corridor that is part of the Trans Canada Trail. Enjoyed by hikers, cyclists, horseback riders, wagon trains, ATV and snowmobile enthusiasts, it forms part of the route of the Iron Horse Ultra 100 marathon. Stay and play a round of golf at the Elk Point Golf Course or enjoy the many lakes and campgrounds around Elk Point. North of Elk Point is the beautiful Kehewin Lake – seven kilometers long with local and provincial parks for camping and watersports. Head east to camp at Whitney Lakes Provincial Park or at Heinsburg on the banks of the North Saskatchewan River. Elk Point boasts an extensive community event schedule. On June 2 enjoy the annual Auto Club Show & Shine that packs Main Street with gleaming chrome. 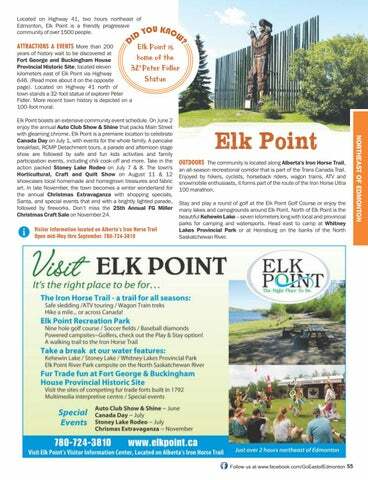 Elk Point is a premiere location to celebrate Canada Day on July 1, with events for the whole family. 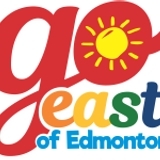 A pancake breakfast, RCMP Detachment tours, a parade and afternoon stage show are followed by safe and fun kids activities and family participation events, including chili cook-off and more. Take in the action packed Stoney Lake Rodeo on July 7 & 8. The town's Horticultural, Craft and Quilt Show on August 11 & 12 showcases local homemade and homegrown treasures and fabric art. In late November, the town becomes a winter wonderland for the annual Christmas Extravaganza with shopping specials, Santa, and special events that end with a brightly lighted parade, followed by fireworks. Don’t miss the 25th Annual FG Miller Christmas Craft Sale on November 24.